Dr. David Benevento and Dr. Eric Benevento are certified as a Functional Movement System (FMS) specialist. 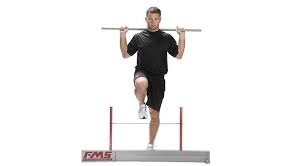 FMS is a rating and grading system that documents movement patterns that are key to function. By screening these patterns, the FMS identifies functional limitations and symmetries. The FMS screen generates a score which can aid in the most beneficial exercises to restore sound movement patterns. The FMS screen only takes 10 minutes. Please feel free to call for an appointment to be screened. Check out the FMS website at www.functionalmovement.com. FMS is an innovative system used to evaluate movement pattern quality for clients and athletes. The key to the Functional Movement Screen is that it consists of a series of simple tests with a simple grading system. The FMS allows the doctor to begin the process of functional movement patterns assessment to individuals without recognized pathology. The FMS is not intended to diagnose orthopedic problems, but rather to demonstrate limitations or asymmetries in healthy individuals with respect to basic movement patterns and eventually correlate them with outcomes. The FMS screen provides the doctor with an evaluation option that relates closely to what the athlete or client will actually do in training. In a sense, the tests are improved by working on variations of skills tested. The FMS allows evaluation with tools and movement patterns that readily make sense to both the client and the doctor. The test is comprised of seven fundamental movement patterns that require a balance of mobility and stability. These fundamental movement patterns are designed to provide observable performance of basic loco motor, manipulative and stabilizing movements. The tests place the individual in extreme postions where weaknesses and imbalances become noticeable if inappropriate stability and mobility is utilized. It has been observed that many individuals who perform at very high levels during activities are unable to perform these simple movements. These individuals are considered to be utilizing compensatory movement patterns during their activities, sacraficing efficient movements for inefficient ones in order to perform at high levels. If these compensations continue, then poor movemenet patterns will be reinforced leading to poor biomechanics. Below is an in-depth look at the FMS test that is administered. The squat is a movement needed in most athletic events. It is the ready position and is required for most power and lifting movements involving the lower extremities. The deep squat is a test that challenges total body mechanics when preformed properly. It is used to assess bilateral, symmetrical and functional mobility of the hips, knees and ankles. The dowel held overhead assesses bilateral, symmetrical mobility of the shoulders as well as the thoracic spine. The ability to perform the deep squat requires appropriate pelvic rythm, closed-kinetic chain dorsiflexion of the ankles, flexion of the knees and hips and extension of the thoracic spine, as well as flexion and abduction of the shoulders. The hurdle step is designed to challenge the body's proper stride mechanics during a stepping motion. The movement requires proper coordination and stability between the hips and torso during the stepping motions as well as single leg stance stability. The hurdle step assesses bilateral functional mobility and stability of the hips, knees and ankles. Performing the hurdle step tests requires stance-leg stability of the ankle, knee and hip as well as maximal closed-kinetic chain dorsiflexion of the ankles and flexion of the knee and hip. In addition, the subject must also display adequate balance because the test imposes a need for dynamic stability. This tests attempts to place the body in a postion that will focus on the stresses as simulated during rotational, decelerating and lateral-type movements. The in-line lunge is a test that places the lower extremity in a scissored postion, challenging the body's trunk and extremities to resist rotation and maintain proper alignment. This test assesses torso, shoulder, hip and ankle mobility and stability, quadriceps flexibility and knee stability. The ability to perform the in-line lunge test requires stance-leg stability of the ankle, knee and hip as well as apparent closed kinetic-chain hip abduction. The in-line lunge also requires step-leg mobility of the hip, ankle dorsiflexion and rectus femoris flexibility. The subject must also display adequate stability due to the rotational stress imposed. The sholder mobility screen assesses bilateral shoulder range of motion, combining internal rotation with adduction and external rotation with abduction. It also requires normal scapular mobility and thoracic spine extension. The ability to perform the shoulder mobility test requires shoulder mobility in a combination of motions including abduction/external rotation, flexion/extension and adduction/internal rotation. It also requires scapular and thoracic spine mobility. The active straight-leg raise tests the ability to disassociate the lower extremity, while maintaining stability in the torso. The active straight-leg raise test assesses active hamstring and gastroc-soleus flexibility while maintaining a stable pelvis and active extension of the opposite leg. The ability to perform the active straight-leg raise test requires functional hamstring flexibility, which is the flexibility that is available during training and competition. This is different from passive flexibility, which is more commonly assessed. The subject is also required to demonstrate adequate hip mobility of the opposite leg as well as lower abdominal stability. The trunk stability push-up tests the ability to stabilize the spine in an anterior and posterior plane during a closed-chain upper body movement. It assesses trunk stability in the sagittal plane while a symmetrical upper-extremity motion is performed. The ability to perform the trunk stability push-up requires symmetric trunk stability in the sagittal plane during a symmetric upper extremity movement. Many functional activities require the trunk stabilizers to transfer force symmetrically from the upper extremities to the lower extremities and vice versa. Movements such as blocking in football and jumping for rebounds in basketball are common examples of this type of energy transfer. If the trunk does not have adequate stability during these activities, kinetic energy will be dispersed, leading to poor functional performance as well as increased potential for micro traumatic injury. This test is a complex movement requiring proper neuromuscular coordination and energy transfer from one segment of the body to another through the torso. The rotary stability test assesses multi-plane trunk stability during a combined upper and lower extremity motion. The ability to perform the rotary stability test requires asymmetric trunk stability in both sagittal and transverse planes during asymmetric upper and lower extremity movement. Many functional activities require the trunk stabilizers to transfer force asymmetrically from the lower extremities to the upper extremities and vice versa. Running and exploding out of a down stance in football and moving and carrying heavy equipment or objects are examples of this type of energy transfer. If the trunk does not have adequate stability during these activities, kinetic energy will be disperesed, leading to poor performance as well as increased potential for injury.